JHA Riding Academy is a hunter/jumper barn located in Slingerlands, New York. It has been family owned for the last eleven years. The trainer and manager Leah Halsdorf focuses on providing an enjoyable atmosphere for both horse and rider. Leah started riding at the age of 7 and quickly realized her passion for horses. 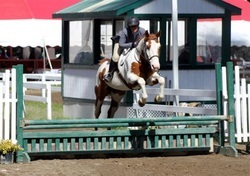 As an amateur rider she has had many accomplishments including, Champion of the Adult Equitation Division and Puddle Jumpers. As a trainer Leah has also experienced much success with students ranging from Beginners to Open Equitation riders. Many of her students have claimed year end championship and reserve awards on the local circuit. However, if horse showing is not your thing you can still enjoy a leisurely ride at JHA. No matter what your goal is Leah works hard to help you accomplish it.